Viewers of FOX29's "Good Day Philadelphia" morning show were lost last week without anchor Mike Jerrick, who was sent home for literally calling "bull----" on Donald Trump's senior adviser Kellyanne Conway during last Monday's live broadcast. But lucky for them, the colorful media personality returned to the air Monday after serving his time and presented his viewers with an explanation for his hiatus and an apology. "Let's get this out of the way," Jerrick, who sat beside co-host Alex Holley, said on Monday after briefly chatting about the weather. "This show is different than every other show and I like to take all of our subject matter over the line, put my toe over a line," he said. He went on to say that his profanity was the reason he was reprimanded and he apologized to his viewers and to Holley. In typical Jerrick fashion, he made sure to make light of the situation by noting that there are seven dirty words that American comedian George Carlin proclaimed can't be said on TV, then he teased "and they are," before quickly and playfully being hushed by Holley. He kept joking for a few more minutes while turning to FOX29 weather anchor Sue Serio and asking her to do something inappropriate to take the heat off him, suggesting she flash the cameras. Serio teased back, "If I could in this dress I would, but it's a little snug," then went on to present the weather. Video of Jerrick saying Conway is "good at bull----" during a "Good Day" segment that aired last week made heavy rounds on the internet, but his station's bosses were less than thrilled with the one-liner and decided to suspend him for his use of profanity. "This is not in line with Fox Television Stations' guidelines and the matter has been addressed," FOX29 spokesperson Claudia Russo said of the incident. Jerrick appears to have made the most of the hiatus. Social media posts on Twitter and Instagram showed him enjoying local views while running and hanging out in style with Pennsylvania Gov. Tom Wolf. 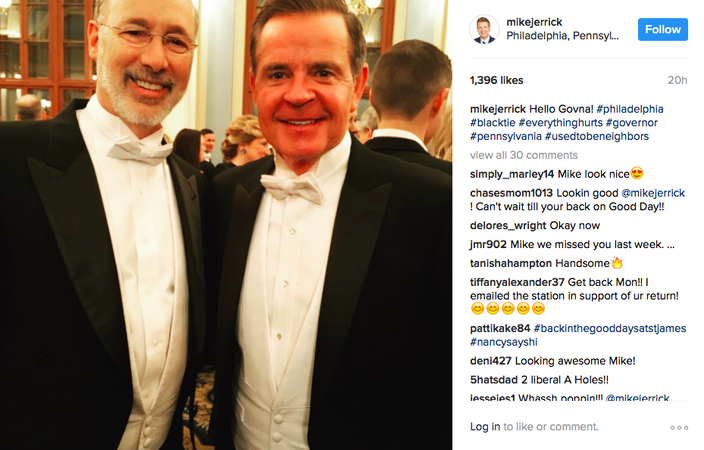 FOX29 anchor Mike Jerrick photographed with Pennsylvania Gov. Tom Wolf. There doesn't seem to be any love lost with Jerrick's fans, who offered their support in comments on his posts. Philadelphia will be happy to have him back on television, ideally with his sense of humor intact.